Returning home to old routines certainly has its comfort. I know where everything is in the kitchen and move about pulling out dishes and utensils without pause. I go back to my morning routine of grinding up coffee beans, the hand grinder clicking away as my hands and shoulders get into the workout. I measure out the coffee, pour the water into the reservoir and start things a brewing. But even though I’m back within the familiar, it looks and feels a little different after being away. There is an awareness of the sound my feet make as I walk across my wood floors and how the air feels and smells as I step out into the backyard. I visited family in Tucson last week. It was quite the weather adjustment going between Minnesota, where the highs had been in the fifties, to Arizona, where the temperatures were in the high nineties. It’s the sharp contrast between the Arizona desert and mountains and the Minnesota woods and lakes that makes me love the desert so much. I don’t know the language of what is dangerous and what is safe there — a combination sure to force you to not spend your days on automatic pilot. 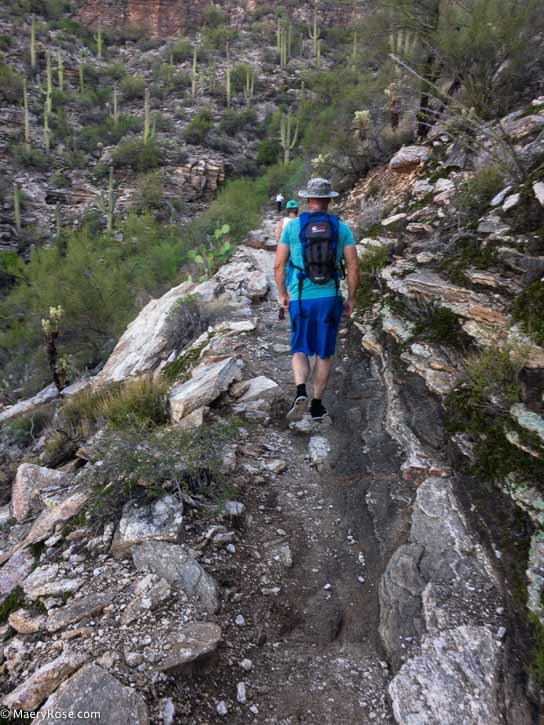 Hiking climbs, with rocky obstacles and slippery sand, were quite a switch for my flatland legs as we hiked in Sabino Canyon and the Starr Pass. My eyes were hungry to take in the jagged red rocks stabbing into the bright blue sky and the cactus, with their mix of beauty and sharp survival skills. There had been a heavy rain the day before I arrived so the plants stood out in their green garb. The Sabino Canyon had been dry the last time I was in Tucson but the day of our hike, the water flowed aplenty. At one point on the trail, we crossed the water, one foot remaining dry while the other did not. But no worries — the desert air made quick work of drying out that shoe and sock as we walked. I was able to hike and eat and shop and visit with my family, something else that I don’t get to do at home. I pictured myself living in one of the cute little houses or apartments we passed by, wondering what it would be like to live in an environment so different from the one I’ve lived in all my life. Getting away makes the old seem fresh again. Or could it be me that changed in such a short time? I know I always learn something new when I visit a place and people, even if its a place I’ve been to before and the people are family. Something of them, of me, of the place, is learned, and I carry a bit of that home with me. I returned to my house with an envelope of letters and cards that I’d sent to my birth mom, plus some letters that she wrote herself. I learned that my mother would write letters out, edit them, then write the final letter that she would send in the mail. There is more information in those draft letters than what ended up in the letters I received. Along with the grief I feel from my birth mother’s death, I feel the grief of her relinquishing me for adoption and our long separation. I feel the grief of meeting so late in life and having so much stand between us being able to get to know each other. So I haven’t read many of the letters yet. I want to draw the curtains open slowly, just a crack of desert light at a time. My eyes and heart need time to adjust to what I see, not just about my mother but about myself. My heart to you Maery Rose. I wish you peace. And seeing some of you photos made me wonder if you were at Starr Pass. I have hiked there myself, although regrettably not at Sabino Canyon. I like the idea of your eyes and heart taking time to adjust to what you see…about yourself. In the process, I hope you see what I see. Hugs. Thanks for all your support Bev! I hope to see you soon. Your ending…”I want to draw the curtains open slowly, just a crack of desert light at a time. My eyes and heart need time to adjust to what I see, not just about my mother but about myself.” Superb. What a strong visual that left for me. On another note, glad you enjoyed Arizona. Of course I’m biased…but it really is a different kind of beauty that’s hard to beat. Hi Robin and thanks. Yes, I love seeing Arizona through your photos. I never though I’d be a desert girl but it does grow on you. Oh, yes … like Robin that last statement stirred me so much and also that you don’t know the language of what is dangerous and what is safe. Supreme writing!